Parkinson’s disease (PD) is an idiopathic syndrome that results from loss of dopaminergic neurons in the substantia nigra. Mutations that increase expression or alter the properties of the synaptic protein α-synuclein (encoded by SNCA) and toxin exposure have been implicated as risk factors for PD. The presence of common, PD-associated SNCA mutations alone does not cause PD, suggesting that environmental factors may be critical determinants of PD pathogenesis. Toxins, such as rotenone, that inhibit mitochondrial respiration induce parkinsonism in animal models, and are strongly associated with PD risk in humans. It is not clear how increased α-synuclein and mitochondria-disrupting toxins work in conjunction to promote neurodegeneration in PD. Alevtina Zharikov and colleagues at the University of Pittsburgh School of Medicine examined how endogenous α-synuclein levels influence dopaminergic neurodegeneration in a rotenone-exposed rat model of PD. Viral-mediated α-synuclein knockdown within the substantia nigra did not alter motor function or the number of nigral dopaminergic neurons in control animals; however, α-synuclein knockdown was protective against dopaminergic neuronal loss and associated motor deficits in rats chronically exposed to rotenone. Further, in rotenone-exposed rats, targeted α-synuclein knockdown in the substantia nigra lessened toxin-induced dendritic damage. These findings indicate that α-synuclein levels influence PD development in response to environmental factors and suggest that α-synuclein may be a potential therapeutic target for PD. 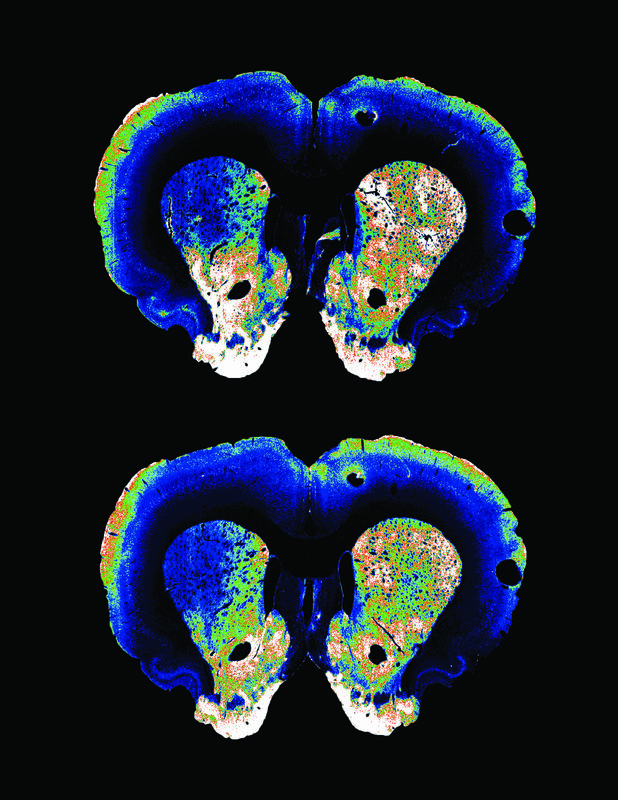 The accompanying images depict dopaminergic terminal intensity (tyrosine hydroxylase stain, pseudocolored by labeling intensity) in the striatum of rotenone-exposed rats. Note that the untreated striatum on the left side of each section shows loss of TH signal, while viral-mediated targeting of α-synuclein in the right striatum protects dopaminergic terminals. Citation Information: J Clin Invest. 2015;125(7):2721-2735. https://doi.org/10.1172/JCI64502. Multiple convergent lines of evidence implicate both α-synuclein (encoded by SCNA) and mitochondrial dysfunction in the pathogenesis of sporadic Parkinson’s disease (PD). Occupational exposure to the mitochondrial complex I inhibitor rotenone increases PD risk; rotenone-exposed rats show systemic mitochondrial defects but develop specific neuropathology, including α-synuclein aggregation and degeneration of substantia nigra dopaminergic neurons. Here, we inhibited expression of endogenous α-synuclein in the adult rat substantia nigra by adeno-associated virus–mediated delivery of a short hairpin RNA (shRNA) targeting the endogenous rat Snca transcript. Knockdown of α-synuclein by ~35% did not affect motor function or cause degeneration of nigral dopaminergic neurons in control rats. However, in rotenone-exposed rats, progressive motor deficits were substantially attenuated contralateral to α-synuclein knockdown. Correspondingly, rotenone-induced degeneration of nigral dopaminergic neurons, their dendrites, and their striatal terminals was decreased ipsilateral to α-synuclein knockdown. These data show that α-synuclein knockdown is neuroprotective in the rotenone model of PD and indicate that endogenous α-synuclein contributes to the specific vulnerability of dopaminergic neurons to systemic mitochondrial inhibition. Our findings are consistent with a model in which genetic variants influencing α-synuclein expression modulate cellular susceptibility to environmental exposures in PD patients. shRNA targeting the SNCA transcript should be further evaluated as a possible neuroprotective therapy in PD.